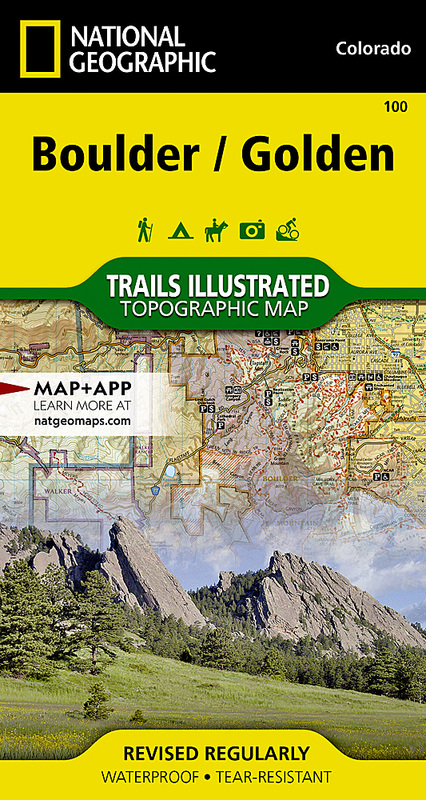 National Geographic's Trails Illustrated map of Boulder and Golden combines unmatched detail with helpful information to offer an invaluable tool for making the most of your exploration of the central Colorado Front Range. Expertly researched and created in partnership with local land management agencies, this map features key points of interest including Boulder Mountain Park, Clear Creek, Golden Gate Canyon State Park, Alderfer/Three Sisters Park, Lookout Mountain, and the iconic Red Rocks amphitheater. The communities of Lyons, Boulder, Golden, Morrison, Aspen Park, and Evergreen are also covered on this map. With miles of clearly marked trails that include mileage between intersections, this map will prove invaluable in your exploration of the region whether you're traveling on foot, bike, horse, or motorized vehicle. Handy trail legends are included for White Ranch, Alderfer/Three Sisters, and Apex parks. The Lariat Loop scenic byway is noted for those wishing to take in the scenery by car. The map base includes contour lines and elevations for summits, passes and many lakes. Many recreation features are noted including campgrounds, trailheads, interpretive trails, boat launches, fishing access, and swimming areas. Helpful material about trail use and etiquette, survival tips, and agency contact information is provided as well.